And we’re back! After a break that was much too long you are now listening to episode 15 of the MudTalk Podcast. And boy, let me tell you, this is quite an episode! In my opinion it has been packed with some of the most helpful thoughts I have read yet. But that may be because pricing my work is something that I’m still trying to figure out. So get excited if you are in the same boat. But first, a couple news items. I just want to give a huge thank you to everyone who has listened and shared or done anything to support the MudTalk Podcast in any way. Just before recording this episode, I took a quick look at the stats. In July there were over 1800 downloads and then in august we had over 2500 downloads. We’re at over 8000 total downloads since episode 1 was published in February. That blows me away. Thank you so much just for giving this thing a chance and especially to all of you who have shared your thoughts. I know the last few episodes have had some long breaks in between. But I hope to get back into a more regular schedule. I’ve had some big things going on this summer. One upcoming event I’ll be participating in is the Michiana Pottery Tour on September 29th and 30th, 2018. If you are located in or near southern Michigan or Northern Indiana, it is a great event full of talented potters and ceramic artists. Get a map and find out more at michianapotterytour.com. I’m itching to get into the responses so I’ll save the next announcement for the end of the episode. Stay tuned for that. So, pricing our work… The elephant in the pottery studio so to speak. It can be a little uncomfortable, maybe even stressful. There are so many variables and everyone has a unique situation so there doesn’t seem to be a one formula fits all solution. 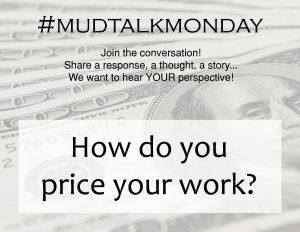 Hopefully some of these comments will give you some ideas to make pricing your work a little easier. Instead of sorting the responses like I usually do, I’m just going to read them in approximate order of when they were made. 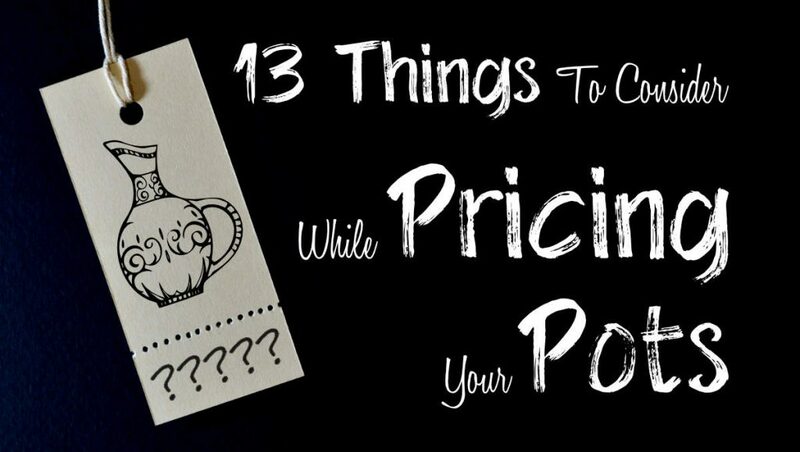 But at the end I’ll share a list of 11 things that you can consider as you price your work. 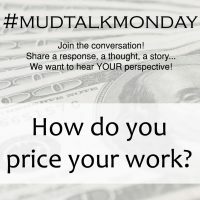 So let’s get to some of the responses to the question: How do you price your work? Kate P There was a very good thread on Potters Network recently about pricing which would be worth looking up. Lots of sensible formulas and ideas. I’ll put a link in the show notes to the Potters Network group on Facebook and some of the pricing discussions. Kimberly W I’d love to hear everyones formulas on how to price their items. I love making pottery so much I have trouble putting a price on it. Plus I look at other peoples sites and sometimes have to take a second look (be)cause the pricing isn’t anything like mine. When i started selling my stuff, The advice I got was: Charge enough first off so your not always changing your prices and make sure to charge enough because its a competitive field and we need the pricing scale to stay constant. Its a place to start, but a clearer formula would be nice. Dallasbradbury shared a youtube video from Make Something. In the video you are encouraged to come up with a day rate, at minimum $500 per day. Then figure out your prices based on your day rate plus cost of materials. There will be a link to the video in the show notes. Hunter_maypottery @acr_art I price my work this way so that my online prices roughly match gallery prices. Prices of pieces may vary based on firing process, glaze, and clay body. Since some take more time and cost me more resources than others. Annaugustinpottery I use a base price of $12 per pound of wet clay and adjust upwards from there. So a basic 3# bowl starts at $36 and that’s for a bowl that’s not footed. I factor in how many times I handled the pot – footing, carvings, etc. Also, I consider glaze. If I use something other than my normal glazes I might have to account for any additional costs. 🔸I keep my prices the same across all selling platforms. Dtaylorsatm There are several warehouse pottery dealers in my area. I am a small batch clay crafter, therefore i price a little below their price to add my creations to the retailers selections. Bcoffman_art Everyone says people appreciate high priced items because they see it as quality. If you live in the “Walmart” Midwest, that isn’t true at all. I have to sell at a lower pric point to even make a sale. It’s all about context when selling. Pinezenpottery I just can’t figure this one out. But I am a total newbie. My friend @snewceramics has impressed upon me the importance of not under pricing my work because it devalues my efforts AND the efforts of other makers to make a living. She also feels that pricing too low eliminates your ability to get wholesale opportunities that can make money. It’s really hard as someone just starting out because I just don’t feel confident enough to price too high. So I started pricing a mug at $22-$25. This last firing I decided to jump it to $33/mug because a lot more work went into each mug. (and 3 is my favorite #) 😁 this past Saturday I bought one of Mariko’s @foragestudios Wonder Woman mugs for $75 and I wouldn’t even blink to spend that much again on a mug she makes. But as another clay person I can appreciate all the work that went into making that mug a piece of art that also happens to carry my morning coffee to my mouth. Theclayteapot I’m a newbie and haven’t actually sold anything yet, but I am working in that direction. I’m a logical thinker so I needed to create something I could remember and that seemed fair. Here’s what I’ve come up with (it may change): charge a base price for any object. Larger size – add $5, trimming add $5, additional glazes used $5, (or $5 each depending on design), carving or other decorations add $5, handles, etc add $5. You see where this is going. Quick to add up in my head. So a regular mug with 2 layered glazes and a trimmed foot would end up being $25 if the base price was $10 (for a new potter). I’m not looking to make a lot of money, this is my hobby. Hope that helps, I’d love feedback on my idea. Foragestudios I think a lot about pricing and what goes into things.. it’s no use trying to compete with Walmart etc, but if you put more one on one love time into say, a one dipped wonder in a souvenir shop then yes.. more than 25 should be your starting line for sure! Plus, if you are giving up to 50 to a gallery you need to seek a price out that makes it worth it just to get up in the morning!! Right?! When I started off I looked at where I wanted to be pricewise, and then looked at my work to see where it was in comparison..when in doubt, ask friends in the business and even gallery owners! Sometimes I find we sort of get blinded by the task and can’t see or evaluate straight!! Enjoy your coffee!!! Canmorepottery Ideally, I’d like to figure out my hourly wage! By now, 8 years in, I have a pretty good idea of a mug’s worth when I see it. (I see underpriced cups often!) But more creative pieces are really tough. A good mug should never be less than $25. Hmpottery Pricing is the difficult part and there are a few things I consider. Pricing equals valuing our own art. And I am my own worst critic. But I feel if we don’t believe in ourselves and our Pottery, our buyers won’t either. The value of our pieces is reflected in the $ we put on it. I also feel that a person’s experience, time, and money invested in perfecting their craft should be counted and respected. As I have taken classes, gotten more creative and my own style started emerging, I increased my prices. I have learned to be more confident in my skill, and really believe the value I am putting on my own pottery. Okay, this may not be the most serious response. But I love it because it helps us see how difficult pricing our work can be. Claybylaura This is a GREAT question and I look forward to seeing what other people say. I confess my method is not totally scientific. I take into consideration time and materials AND I also try to account for my creativity. I have one or two lower priced items that I consider advertising. I believe I need to have an item that any potential customer can afford; then I try to make them a repeat customer. It does not work every time — but in the long run, has led to future sales. Sometimes I research a little to see what other people charge for items. For me, this is one of the hardest parts of the clay making/selling process. I love this comment from Clay By Laura. She considers a number of variables and has thought through why she prices things a certain way. But even after all that, it’s still not easy. So, what do you think? Do you have some new ideas to work with when you price your pots? Hopefully you have a little more clarity. I don’t consider myself qualified enough to offer advice on pricing your work but I will say this: Your work and process and situation are not the same as anyone else. So don’t feel like you HAVE price your work a certain way. Figure out what works for you. There were a few resources mentioned and I’ll have a link for those in the show notes. Go to expertclay.com and click on PODCAST in the top menu to find the list of episodes and you can click on each episode to read the notes. Go to expertclay.com and click on BLOG in the menu to read more about each idea. And now for the big announcement before we close this episode. Okay, maybe not big… but something pretty cool. If you didn’t already know, I’ve designed some pottery shirts and have sold them through instagram and potterymakinginfo.com for a little while now. But now I have launched a site dedicated to nothing but pottery shirts. Find it, of course, at potteryshirts.com. Now you can get a better selection of shirt styles and colors than before. I still need to make a few small fixes and organize some things but you can order yourself a new shirt as you listen to this. And I’m currently working on a new design made just for the listeners of this podcast. I should have it ready by the time you listen to this so go see if you can find the new design. If you need a hint, just listen to the very end of every MudTalk podcast episode. Head over to potteryshirts.com and take advantage of a special site-launch discount. Yes, for a limited time you can save a few dollars on every shirt that you order to celebrate the new site. Remember, every purchase helps support this podcast, potterymakinginfo.com and expertclay.com. Thanks again for all your support. In our next episode, we’ll find out what one skill you would like to increase the most. Good luck pricing your pots and until next time, stay muddy.